I can't believe it's my last day in Cuba, unfortunately time does fly when having fun. 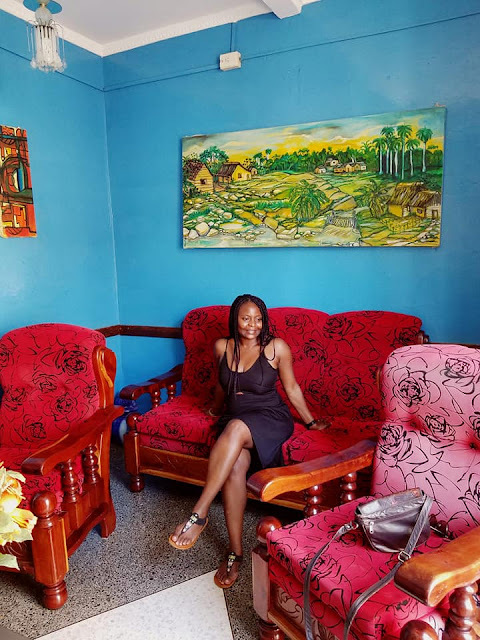 I wanted to make sure that my last day in Havana was going to be relaxing because I have been on the go so much and haven't had any time to really relax and just take in everything around me. I slept in late which felt really good then had a feast for breakfast thanks to my airbnb host Yuneisy, I had to switch houses because Damian and Chaveli's house had been booked on the last day I was going to be in Havana. Yuneisy recommended that today being Sunday I should check out this one street called Callejon de Hamel. Every Sunday there is Rumba Cubana which is Afro Cuban song and dance performed on this street. Now this was one event that I was not going to miss! The performances usually start at noon which worked perfectly for me because it gave me an opportunity to relax and sleep in before heading out. When the time came I made my way to the location which was not too far from Yuneisy's house, the directions I had been given were very straightforward and as I got closer to Callejon de Hamel I knew I was on the right path as I could hear very lively drums and singing. 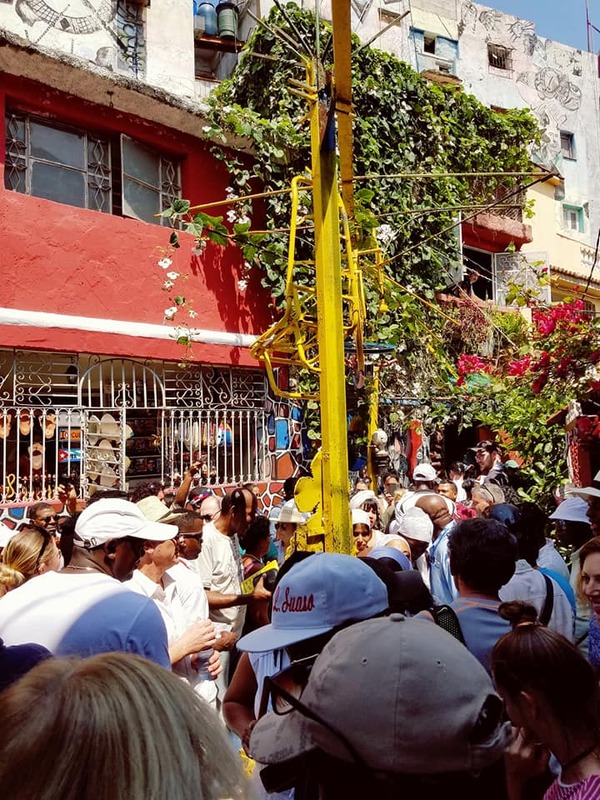 When I arrived at the site of the performances the street was already packed with tourists and locals and with my short stature I was lost in the crowd and it was hard to see the stage. Luckily I managed to locate an elevated spot that I quickly made my way to and I was able to get a really good unobstructed view of the dancers and singers. The performances were amazing and I have to hand it out to the dancers who had crazy stamina given how vigorous the dances were and how long they were able to perform without skipping a beat. I watched the performances for a few hours before deciding to leave. It was so hot that I could feel sweat dripping down my back! it didn't help that the space was very small and there were so many people. It was worth it though and I am so glad I got to check this event out. 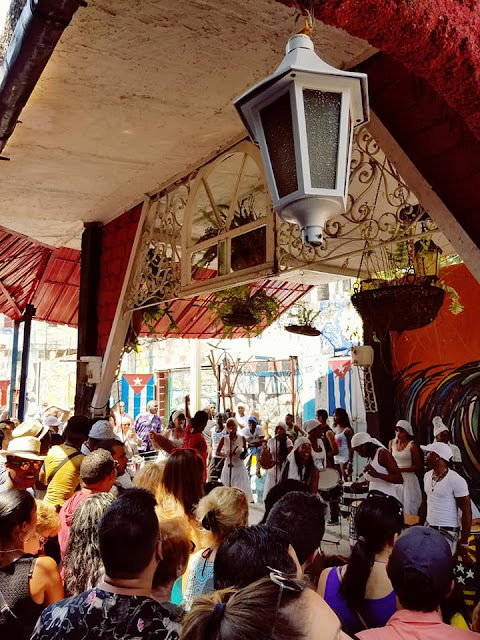 For anyone reading this and planning on visiting Havana, make sure to stop by Callejon de Hamel on a Sunday afternoon for some good live Rumba Cubana performances. I made my way back to Yuneisy's house and we hang out spending time just talking and taking photos as we waited for her husband to get home. They both wanted to offer me a late birthday surprise, how sweet! right? I always end up meeting amazing people during my trips and that's part of the reason why I love traveling so much. 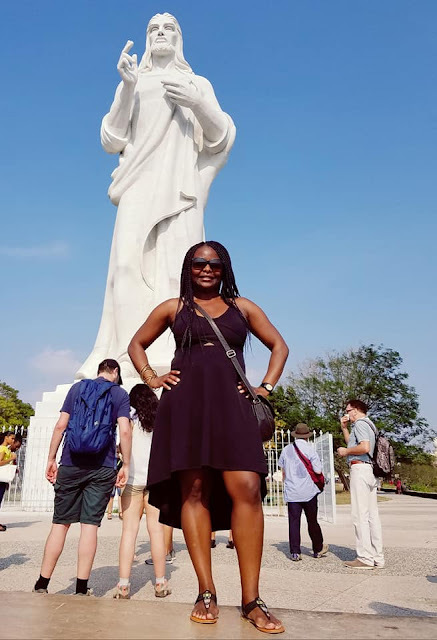 Yuneisy asked me if I had the chance to check out the statue of Christ which overlooks the city, the area where the statue is gives you a very good aerial view of the city and at night many couples like going there to spend some romantic moments. I hadn't visited the area so their gift to me was to drive me there to take photos, they told me we could spend as much time as I needed and they would be at my service. I was so moved and touched by their kind gesture, they really didn't need to do anything for me but they chose to because they wanted me to feel special and have some memorable experiences in Havana. I didn't take as many pictures because I was busy taking in the lovely views and chatting with Yuneisy plus there were so many tourists and it was a hustle trying to find a good spot for a picture. Yuneisy showed me what once used to be Che Guevara's house. It's big and the view from the house is stunning as it overlooks the city below. I see the man lived very well in Havana! After spending some time admiring the view around, Yuneisy and her husband asked me where I wanted them to drop me off as they had guests coming to their house and they needed to go meet up with them. I requested that they drop me off at Damian and Chaveli's house. I wanted to hang out with them one last time before leaving plus they had invited me to come see them. I spent a couple of hours conversing with Damian & Chaveli and met some of their extended family who welcomed me with open arms. After many hugs, kisses and promises to keep in touch I had to say goodbye, I left their house and decided to head to Havana vieja to walk along the lively Obispo street one more time before going back to Yuneisy's house to start packing my stuff in preparation for my departure the next day. I noticed so many pictures and photos of Che Guevara around the places that I have traveled to in Cuba and when I asked how come Fidel Castro's photos are not as prominent, I was told that before dying he requested not to have his photos displayed so that's why they are not as prominent as Che's. Having no easy internet access has been a challenge, I feel so cut off from everything but then again, its been good to just shut off and focus on my surroundings and the people around me. I was having a conversation with Yuneisy and she was telling me that there are a lot of men in Havana who practice "gay for pay." During the day they have their wives and kids but at night they sleep with ole tourists for money. Abortion here is legal and some women end up having so many abortions as means of birth control. I was chatting with this one Cuban lady and she told me she has had 7 abortions! before I could pick my jaw off the floor she casually added, "I have friends who have had 10 to 14 abortions." I was too shocked to even ask why not use contraceptives, I was literally speechless! Airbnb has presented a very good opportunity for local Cuban families to earn a living. 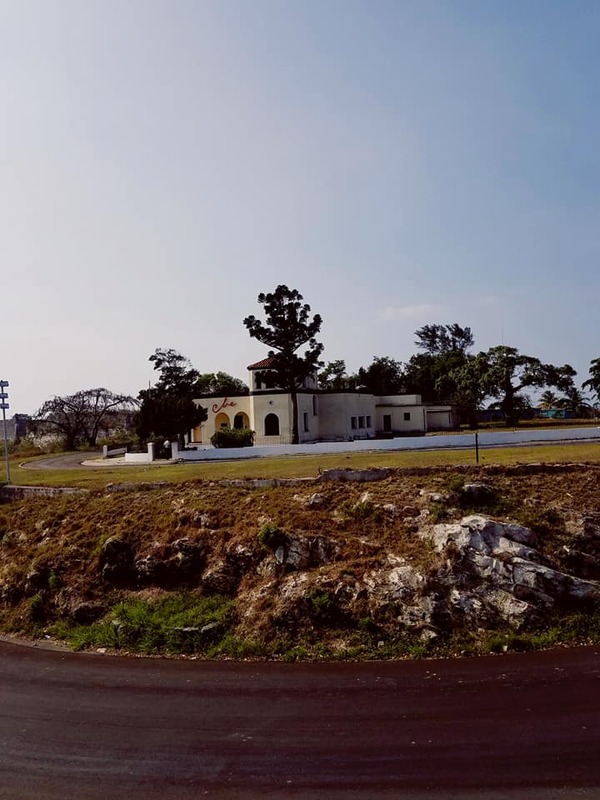 Salaries are low here especially if you work for the government, both the hosts that I have stayed with here in Havana had regular jobs before quitting and focusing on airbnb which helps them make more money. Its admirable to see how they have converted their homes to maximize their income potential via ariana. 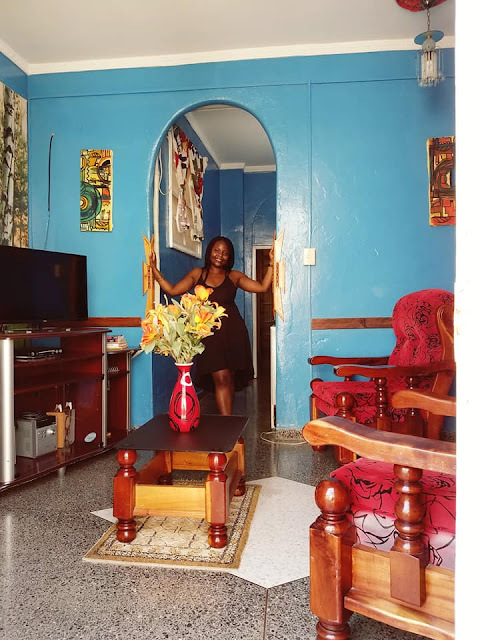 Yuneisy's husband was a civil engineer and Yuneisy herself was a physical education teacher, they decided to get into airbnb and it has paid off very well for them. They both quit their jobs to focus on their airbnb venture, they ended up doing so well that they got another house which they also use to rent out on airbnb.